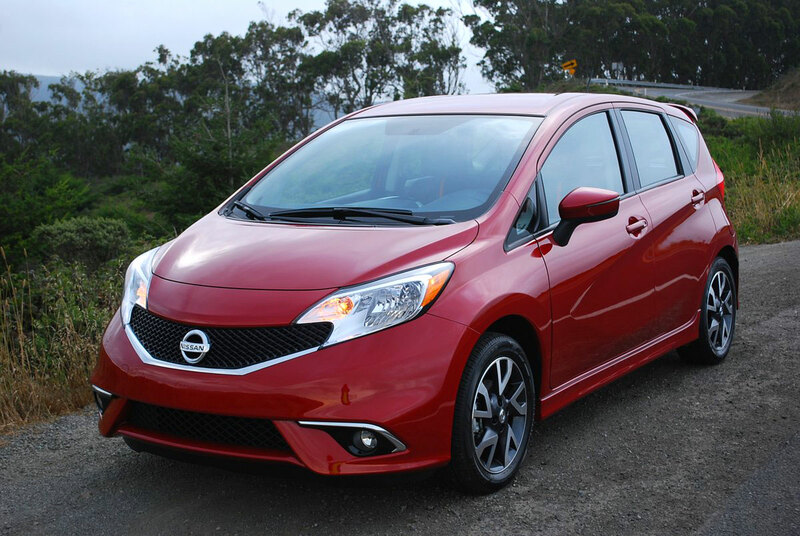 Nissan’s SR Versa strikes a new Note for 2015. From the outside, it’s apparent the SR is no base Note. Rather, it sings a different tune thanks to its unique front and rear fascias, side skirts, mesh black grill, black headlight enclosures, and machined-spoke 6×16″ alloy rims. Inside the smoked headlight enclosures sit multi-reflector Halogen bulbs. The exterior rearview mirrors contain neatly integrated turn signal indicators, and the tail of the roof incorporates a sizeable spoiler. 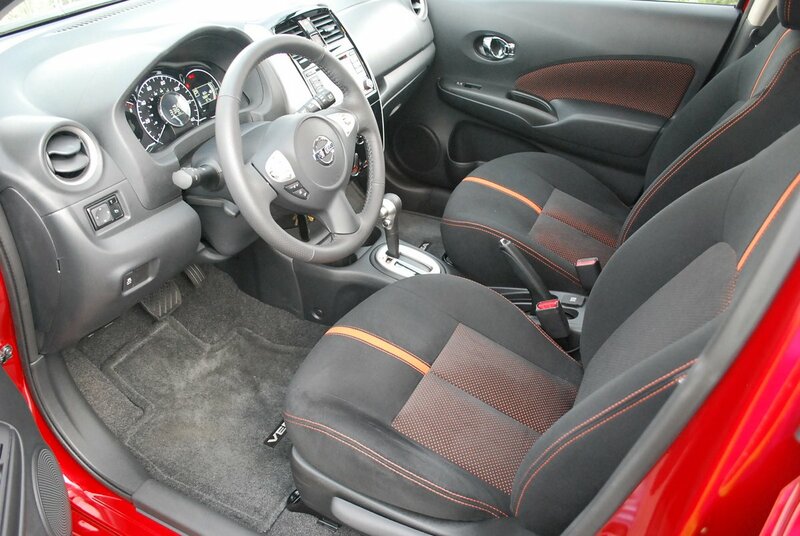 Inside, seats covered with simulated suede continue the sport motif with orange racing stripes and stitching. Chrome door lock plates enliven the interior, along with silver trim accents on the shift lever and instrument panel. All these cosmetic changes elevate this Note to a higher key, by reconfiguring its appearance from boring to enticing. But does its performance live up to the promise of the pomade? Not quite. The sporty looking SR still utilizes the base Note’s economic 1.6 liter four, which commendably averages 35MPG in combined city/highway driving. The price you pay for such meager fuel consumption is lethargic straight line performance. 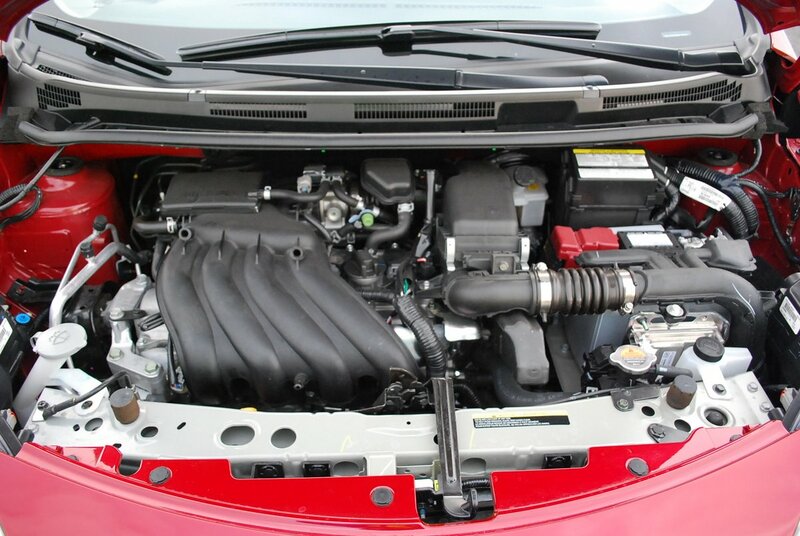 With only 109hp and 107lb.-ft. of torque on tap, this engine needs special help from its gearbox to complete quick passing maneuvers, But with the SR’s “Xtronic” transmission, the overtaxed motor hardly gets any help at all. Since this continuously variable transmission lacks actual gear sets, you’re restricted to just 2 ranges of choice, Drive and Low. Drive range is relatively quiet because it keeps engine rpm low. But it also sedates power output, mandating a shift into Low range when you need extra punch. Low range does improve zip from tepid to acceptable, but at the expense of much increased noise from the suddenly high revving engine. There is no happy median between these two widely divergent conditions. 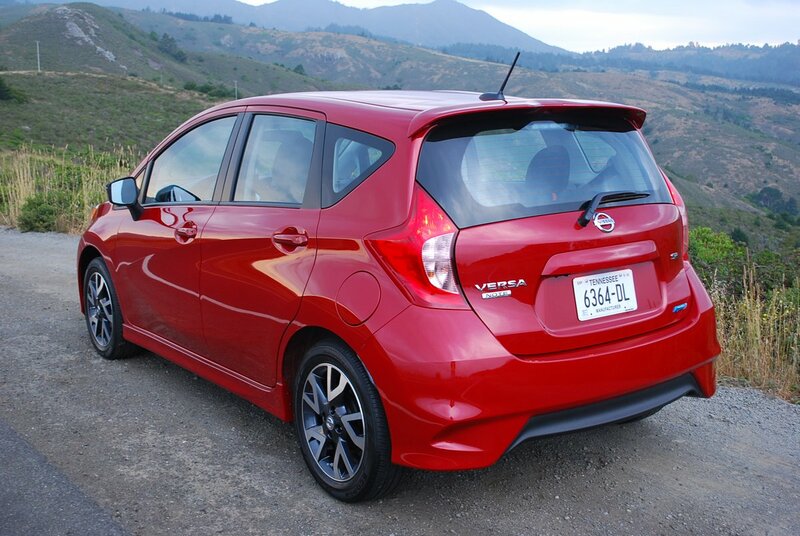 The gearbox conundrum stifles the performance of an otherwise nimble Versa. Ride quality for such a short wheelbase car is surprisingly posh. The 195/55R16 Bridgestone Ecopia tires are partly responsible for good bump absorption, due to their tall 55 series sidewall profile. The Note remains reassuringly level and unflustered when pressed through switchbacks. The addition of a 370Z style steering wheel, complete with dimpled leather handgrips, furthers the sporting illusion. The manually adjustable front seats feature 6 change opportunities for the driver and 4 for the passenger. The surprisingly spacious rear seats offer decent comfort, and enormous legroom considering the diminutive size of the Note. Thanks to low window sash height, the interior feels spacious rather than constricted, a notion corroborated b y the numbers: 94.1 cubic feet of interior room and 18.4 cubic feet of trunk space in this hatchback. Nissan equips the SR Note with a wide variety of safety instruments, including side impact and curtain airbags, Traction Control and Vehicle Dynamic Control. Although the braking system includes anti lock technology (ABS) and electronic brake distribution (EBD), the system makes do with front discs but rear drums. We experienced mediocre brake retardation when slowing to a stop from freeway speed due to a lane closure. The pedal required more than moderate pressure to deal with this unexpected stoppage. 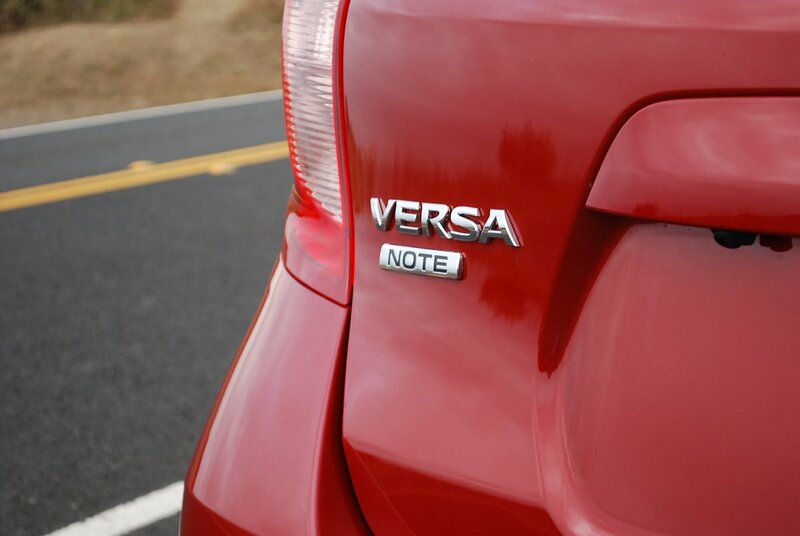 The Versa Note SR offers unquestionably good value as basic transportation. Considering its $17,530 base price, you enjoy a lot of plusses for your limited investment. It will transport four in comfort, with a full size door for each. It will duck into parking places fatter hatchbacks spurn. It will run for a week on less than half a tank of gas. What it won’t do, however, is live up to the spanking promise of its new SR dressage. For that kind of performance, the spoiler and racing stripe brigade will have to look elsewhere.